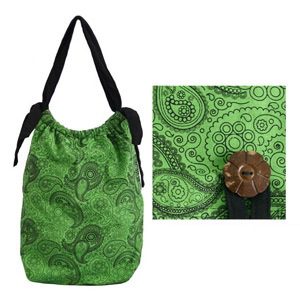 The Lanna bags artisans handcraft this versatile shoulder bag with cotton. 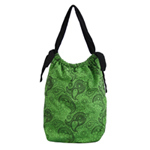 The exterior features mesmerizing black motifs on green. The interior is lined with cotton and hides two inner pockets to keep items handy. The sides fasten with coconut shell buttons and the straps lengths can be adjusted and tied as desired. Materials: 1100% cotton. Coconut shell. Lining 100% cotton.